Unsightly bulges are eliminated with a contouring procedure that Dr. Kasrai customizes according to your unique goals. You don't have to be at your ideal weight to have it done, either. There’s hardly any need to introduce liposuction, is there? Considering how popular it is, liposuction is the quitessential body controuring tool. It gets rid of unwanted fat on your face and/or body to give you the sleeker, toned shape you want. And, the best part is the fat cells that are removed during your surgery do not grow back. So, if you gain weight after surgery, you'll be pleased to know that it won't get concentrated in your previous “problem areas” — the fat will be more evenly distributed. Even if you gain weight after your surgery, your treated areas will always look better than if you hadn't had the surgery performed at all. I have closely examined the surgical techniques I apply and the results I've achieved for my patients. This has allowed me to establish a superior surgical approach that achieves consistently satisfying results for my liposuction patients. You’ll enjoy great looking results, with a shorter recovery period and minimal scarring. Liposuction can only remove the fat located just underneath the skin, known as subcutaneous fat. It can't remove the fat in and surrounding your internal organs, known as visceral fat. The incision(s) is always in an inconspicuous place. Usually, that’s within a natural crease in your skin. It could also be in an area that's covered up by underwear or a bathing suit. The length of the incision(s) is as short as possible, measuring mere millimetres rather than centimetres or inches. In addition, I have designed instructions on how to care for your incisions after surgery, specifying things that will help make them heal faster. Scars become thin silvery lines that are barely noticeable. There are several methods of liposuction available, but I only use those that have been repeatedly proven to make the surgery less traumatic. For example, there is extensive research on tumescent liposuction to prove its effectiveness. This technique involves injecting the targeted area with a high amount of solution that contains anesthesia. This not only breaks up the fat for easier removal, but also provides you with a more comfortable experience during and after your surgery. The broken up fat reduces the number of times the tube (cannula) is pushed back and forth in the treated area for less trauma to your body. You also don’t need to “go under” (general anesthesia) — tumescent liposuction can be performed under local when treating a single area. Less bleeding and less bruising means a shorter recovery period and faster results! The diagram on the left shows how your fat cells are removed with a liposuction cannula. 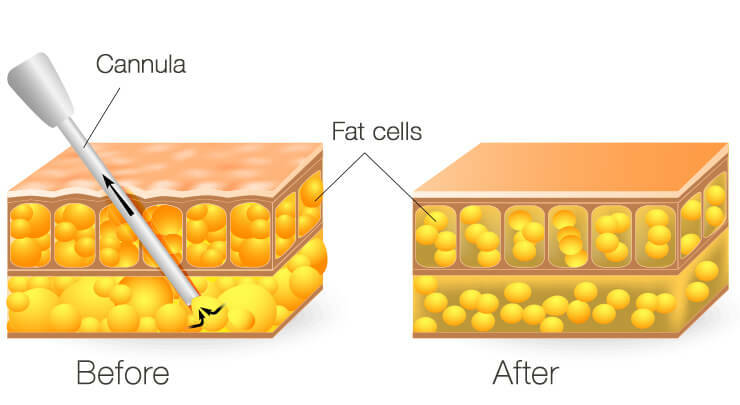 The diagram on the right shows the decrease in the number of fat cells after treatment. Chance of Complications According to medical research, it is associated with the lowest rate of complications. According to medical research, it is associated with the highest rate of complications. According to medical research, it is associated with a moderate rate of complications, including seroma, hematoma and infection. Reported Pain Levels Minimal. Prescribed pain medication isn't necessary but can be taken. Significant. Prescribed pain medication is necessary. Minimal. Prescribed pain medication isn't necessary but can be taken. If email works best for you, drop us a line. I always look at your facial and body contours as a whole, rather than in individual sections. That way, I can measure the amount of fat to be removed more accurately. I consider your natural proportions and what would be the most harmonious improvement. As a result, it is very rare for my patients to experience an under or over correction. Other surgeons enforce the rule that patients need to be at a specific weight or within a normal BMI range before having surgery. I find this unnecessary. In fact, a drastic change in your lifestyle just to lose the extra pounds right before your surgery can even be counter-productive and make the whole experience more dangerous for you. You shouldn’t be put into a category that disregards your unique body type and frame. A woman who is on the muscular side will naturally weigh heavier than someone of the same height but with a thinner frame. Yet both women may still be at a healthy weight for their body. It doesn’t make sense to apply a weight restriction that doesn’t consider this fact. If you are at a stable weight but have stubborn areas of fat that simply don't respond to diet and exercise, liposuction can still be safely performed to achieve your desired results. Please be aware that liposuction is not a weight loss tool. It is also not effective in the treament of cellulite and should not replace exercise and a proper diet. It is for relatively healthy, fit people who want a little extra help achieving a slimmer, attractively proportioned body. It removes pockets of stubborn fat, not high amounts of fat everywhere on your body. The amount of fat removed won't make a significant impact on your weight. If you want to lose weight, you should consider healthy changes to your lifestyle and diet before considering any type of cosmetic surgical procedure. First, anesthesia is administered. I will discuss your best options for anesthesia during your consult: for extensive work, general anesthetic is recommended. Local, local with intravenous sedation, or regional anesthesia (similar to an epidural used during childbirth) are options for smaller amounts of fat to be removed or when only one area is treated. A tiny (and very inconspicuous) incision is made in the surgical area. A large amount of anesthetic solution is injected into the area, causing the fat to become swollen and firm. This allows the liposuction cannula (a thin tube with a tiny circumference) to move smoothly under the skin. Using the cannula, fat is broken up beneath the skin then suctioned out with a vacuum pump or a large syringe. The incision is then closed and dressed. Generally, an overnight stay isn’t required so you can go home a few hours after your surgery. Although you will notice a difference in your body right after surgery, the change will become more apparent after 4-6 weeks, after the swelling has gone down. You will be able to get back to work in 2-3 days; for that time, rest quietly so you can heal faster and get a better result. Pain medication can help dramatically improve your comfort. Light exercise will be fine after two weeks. However, for running, weight lifting or other vigorous activity, wait about a month. You will wear a custom fitted Lycra compression garment for six weeks to decrease swelling and bruising. The garment also helps your skin tighten up to your leaner contour. Please wear it as advised. If you find it leaves marks on your skin, you can flip the garment inside out or wear a fitted thin, seamless cotton garment underneath. Those pockets of fat that you've tried so hard to get rid of with exercise and dieting will finally be gone! Enjoy your leaner, fitter look and continue leading your healthy lifestyle, as it will work to maintain your results. Liposuction removes unwanted fat on your face and body that's located just below your skin (known as subcutaneous fat). The fat removed is suctioned out with a cannula. It's also known by many other terms: liposculpture, lipoplasty and lipo. Some surgeons promote liposculpture as a way to sculpt the bodies of patients who have very low body fat percentages, like bodybuilders. Also known as high definition liposuction, the technique is usually reserved for the abdomen to redefine a six-pack. Does it tighten the skin? It's a common mistake to believe that liposuction can tighten the skin. While some liposuction techniques are promoted as being able to firm up the skin in the area treated, it can only do so at a very minor extent. Saggy skin can only really be firmed up by removing the excess by excision, something that a tummy tuck or thigh lift would do. It's best not to rely on liposuction to do this, because you'll most likely be disappointed. Liposuction can be safely performed at the same time as your abdominoplasty or thigh lift. You may be if you are at a stable, and preferably ideal, weight, and are generally healthy. You should have realistic expectations of what liposuction can do for you — which is to eliminate pockets of bulging fat that are ruining your overall body contour. Liposuction is not a method of weight loss. If you're getting it to lose weight, you'll be disappointed. The amount of weight you lose will only be one to five pounds at most, or nothing at all. However, some patients who see how great they look after are inspired to lose more weight and keep it off. Why can't I decrease the fat in my thighs or stomach, even though I exercise and diet regularly? Your body will naturally store fat, and it will do so in certain places where you're genetically programmed to have it. 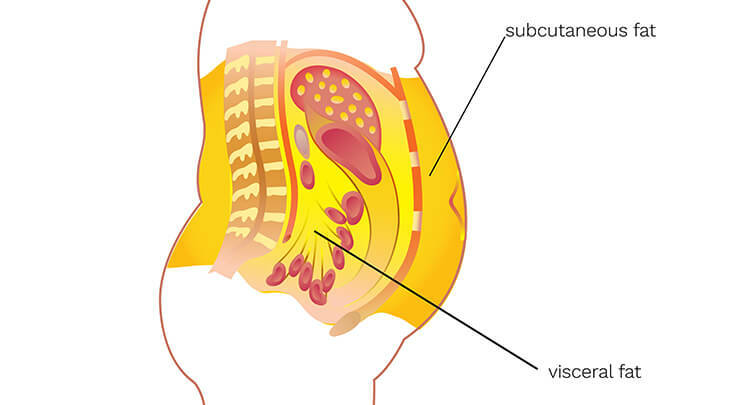 You may have low body fat, yet still have a pot belly or saddlebags. Do I need to go under for my surgery? This depends on how much fat and how many areas are treated. It is common for local anesthesia to be administered, however if your surgery is more extensive, you may need general. How much fat can be removed during surgery? This depends on your body and goals. The maximum amount of fat that can be removed by liposuction safely is about 10 lbs. However, this is not the average amount that I tend to remove because my patients don't require that much. In addition, research published in Plastic & Reconstructive Surgery has found that the higher the amount of fat removed, the higher the risk of complications. When will I see my results? You may seen an immediate improvement but swelling will hide your results. Allow for swelling to subside. The majority of it should disappear within a few weeks, although it may take a few months to disappear completely. Liposuction removes unwanted fat cells permanently. Weight gain after your surgery may cause the area to grow, but your overall body contour will look more balanced. There is a higher risk of these complications in patients who are smokers, are diabetic or have poor circulation. You can reduce your risks by following my detailed instructions, resuming activity after surgery, and by not smoking. Dr Leila Kasrai Find out more about board certified plastic surgeon, Dr. Leila Kasrai. See Before & Afters Check out how patients look before and after their surgery. Individual results may vary. There are no implied or any other kind of guarantee of treatment results.